Fill steamer with two inches of water. While steam builds, slice collard greens leaves into ½-inch slices and cut again crosswise. Cut stems into ¼-inch slices. Steam collard greens, and onion slices if desired, for no more than 5 minutes. Transfer to a bowl. 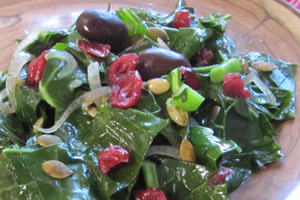 Toss greens with remaining ingredients and any optional ones while greens are hot. The dressing doesn’t need to be made separately. You can mix it in with the greens.